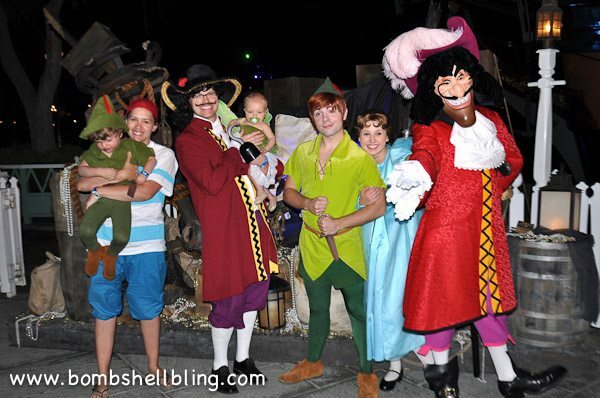 I have been busy busy working on Halloween costumes for our family today, so I thought this may be a great day to share our costumes from last year: Family Peter Pan Costumes! 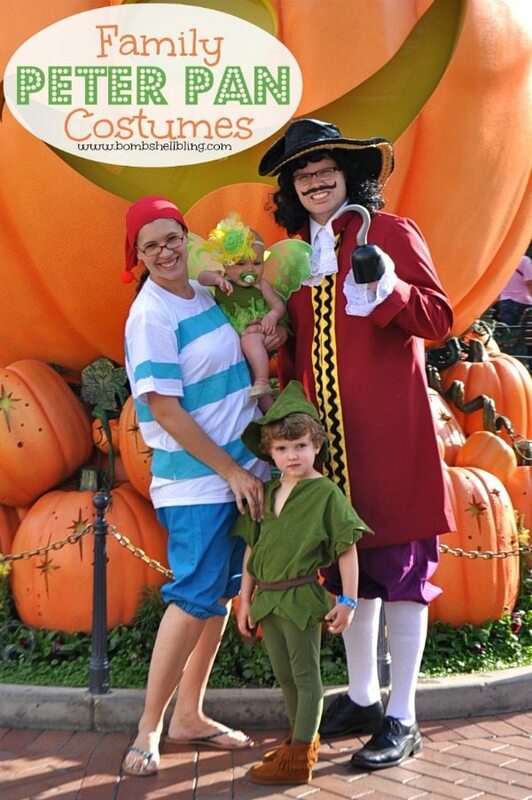 Last year we were able to take the trip of my dreams to Disneyland on Halloween. (A suggestion on how to take this trip yourself at the bottom of this post!) The second I saw pictures of Cars Land at California Adventure I was agonizing over not being able to take my boy to see it. 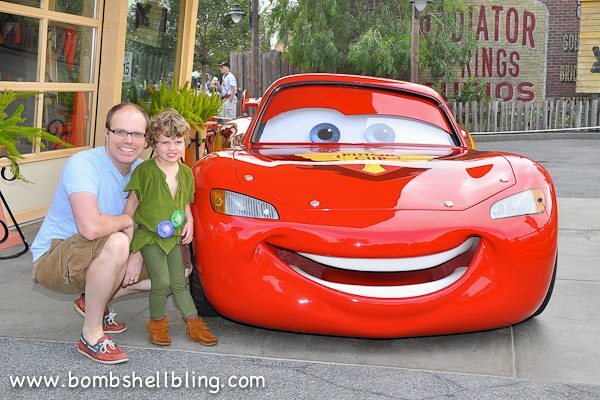 He had been WILDLY obsessed with the movie Cars for almost two full years, and I just knew that then was the EXACT moment when it would be the most magical for him. Well, my dad must have gotten sick of listening to me moan and groan about how we couldn’t afford to go to Cars Land, because one night when I was whining about it (we live with him right now to save money because my husband is in the midst of his very, very long medical training) he piped up and informed me that he had frequent flier miles that were about to expire….so we could use them to go. I just about fainted from joy!! Not kidding. I FREAKED out!! Especially since my husband happened to have the week of Halloween off (he gets three weeks randomly assigned to him each year, so it was pure luck), so I knew that I would be in Disneyland ON Halloween!!! EEEEEK!!!! 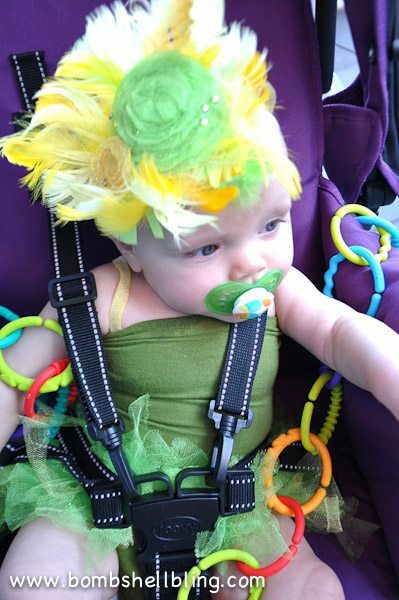 I love all things colorful, kid, and, as you know by now, HALLOWEEN!!! So, since we were going to be attending Mickey’s Halloween Party on Halloween I decided to pull out all the stops and go for family costumes. In 2011 my boy wanted to be Peter Pan, and his grandma (the fab seamstress behind the Cheetah Costumes that I shared earlier in the year) obliged by making him this darling costume. 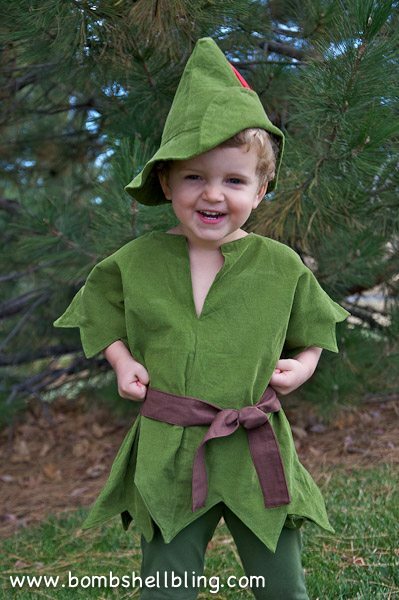 (In case you couldn’t tell by the hat, it’s a modified Robin Hood costume pattern.) Isn’t he just the cutest little squishy-faced thing?! I can’t believe how fast he is growing up!!! Well, when we asked him last year (2012) what he wanted to be he said Peter Pan again. Gee….twist my arm, kid! Luckily, the costume still fit, although the pants were a bit sketchy in length and tightness. 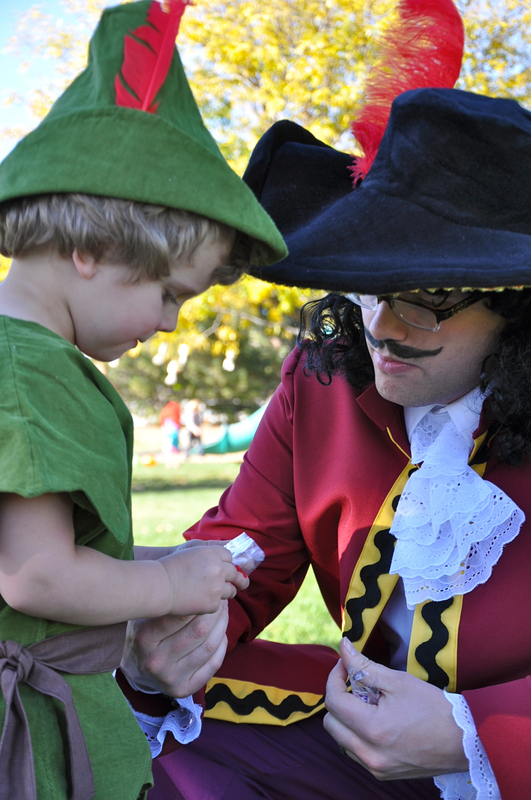 However, this year he insisted that he wanted his sister to be Tinkerbell, his dad to be Captain Hook, and his mom to be Mr. Smee. My, my….how glamorous! 😉 We hadn’t done the family costume thing in years past, but I figured this was a golden opportunity, so we went for it. Luckily for me, Grandma Paulette (my mother-in-law) stepped up to the plate once again and helped me make costumes when she came to visit in early October. More specifically, she made Captain Hook’s coat. Isn’t it rad?! She used a pattern and just modified it a bit in length and flare to look more like the cartoon character’s jacket. 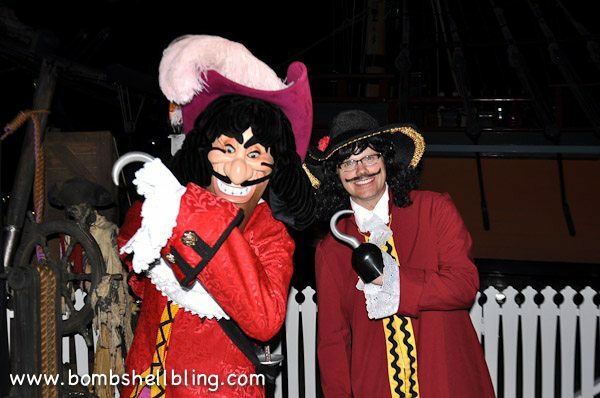 She used gigantic black ric rac sewn down the front for the illusion of the detail in the front of the “real” Captain Hook’s coat. 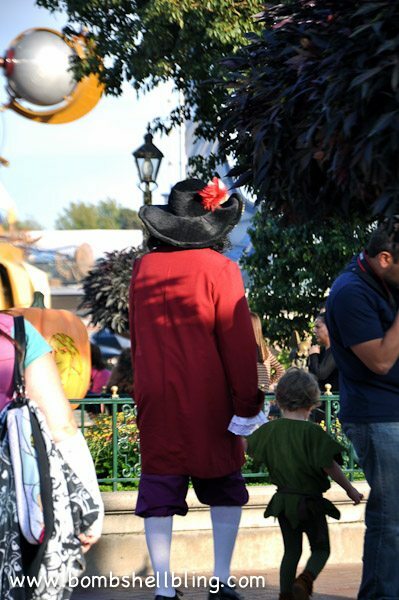 I pulled together the rest of Captain Hook’s ensemble by buying a plastic hook and a hat. I could only find a weird woman’s pirate hat, so I ripped the bows off of it, glued it to be flipped up, and added a huge feather. For the shirt my husband just wore a dress shirt, and I took huge lace and folded it back and forth (zig zagged, if you will) and added a few stitches by hand to lock the folds into place. Then I stitched the lace piece onto some elastic that wrapped around his neck, hiding under his shirt collar. It gave the illusion of a lacy cravat. I also took the leftover lace and stitched it onto the inside of the coat sleeves to poke out. Finally, I sewed him some pantaloons using a pattern and bought him some crazy-long tube socks. Add an eyeliner-drawn moustache and you are good to go! I love these two together. They created QUITE a splash walking around all day hand in hand. CUTEST!! 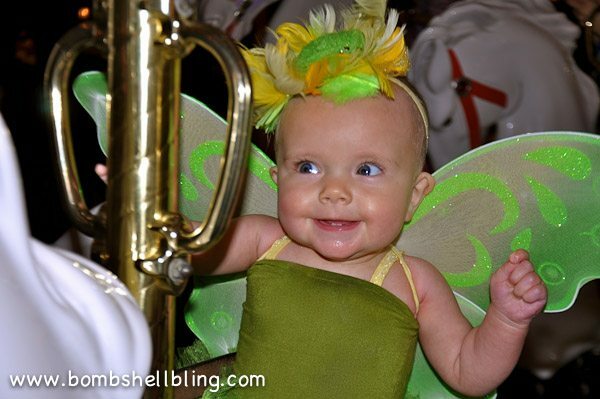 Now let’s chat about my little Tinkerbell. She is too divine for words, is she not?! I wish she would just stop growing up already!! Happy, chubby baby. I love her little FACE!!! (Have you heard of “Cute Aggression,” by the way? It’s a real thing! And I am the POSTER CHILD for it. Just ask anyone who knows me in real life. I was to nibble those baby cheeks until they can’t be nibbled any more!!!) 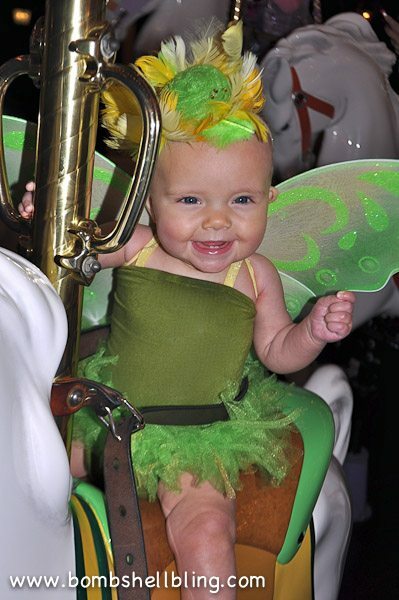 ANYWAY….time to get a grip and talk about Princess Jade’s Tinkerbell costume. To make her little tube dress I just bought a super stretchy knit at JoAnn’s Fabrics and used her onesie as a guide. I laid it on the fabric, cut two pieces, hemmed the top and closed up the crotch. Then I used glitter elastic (the same kind I’d use for a headband) that I found at Fleuriste Supplies and sewed it on as straps. Obviously, I bought the wings, although I did use hot glue and the glitter elastic to replace the elastic on them so that it would match and be cuter. Her tutu is a simple knot tutu. I measured her waistline, cut and sewed green elastic that size, and then tied a load of sparkly green and yellow mesh strips to it until it was as full as I wanted it to be. This ludicrously over-the-top headband was made with more of the glitter elastic. Then I made a feather bed for the rolled flowers and used the leftover glitter mesh and a LOW temp glue gun (so the mesh wouldn’t melt instantly) to roll some flowers and hot glue them on top of the feather bed. For instructions and tips on how to make a feather bed and roll flowers, see THIS post. Finally, I hot glued rhinestones randomly on top of the flowers and feathers. Sadly, my little lady pulled this masterpiece off and threw it down midway through the night and it never did show up again. I was bummed not to get to do a more formal photo shoot of her in her costume at home, but I wasn’t about to try to recreate that fabulous monstrosity! Doesn’t my crew look fantastic?! I think they do!! 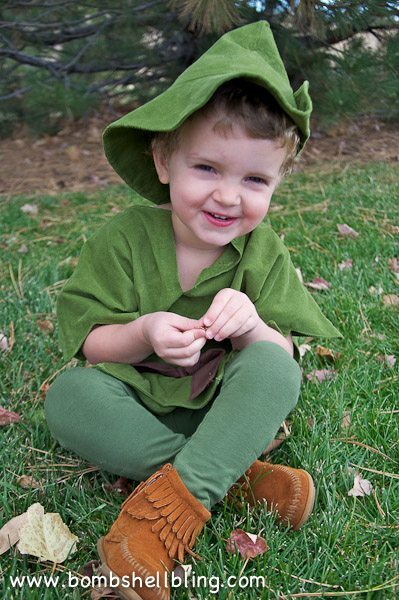 My tiny little Peter Pan said he was DYING to meet the REAL Peter Pan. Usually Peter isn’t out and about, but since it was Halloween he WAS. 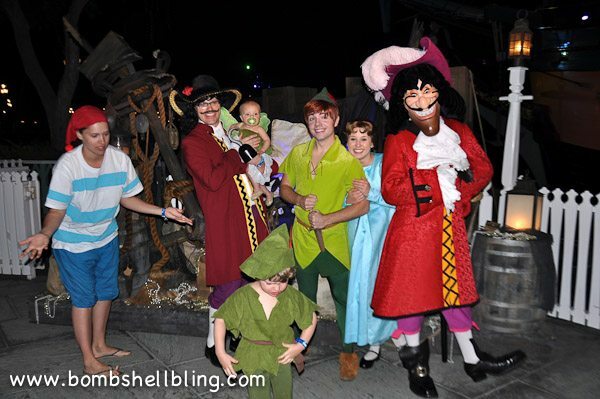 We waited in line to meet the “real” Peter Pan for almost two hours. 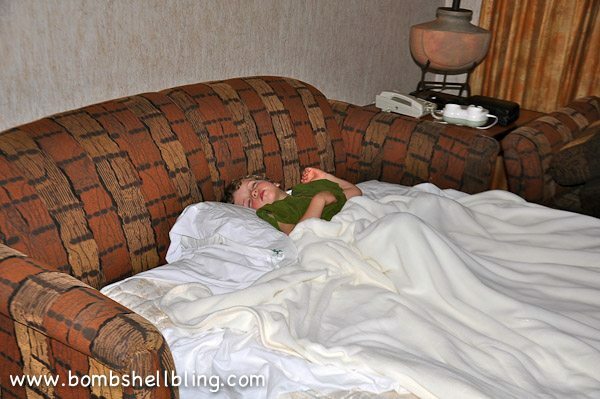 It was several hours past bedtime by the time we got to meet him. And this is how that meeting went down…. Go figure. That picture pretty much summed up the evening. Noticed that Tinkerbell had even lost her headband by then. Ay ay ay. I can laugh at this picture now….kindof. 😉 Needless to say, this happened about 0.5 seconds after we got back to our hotel. 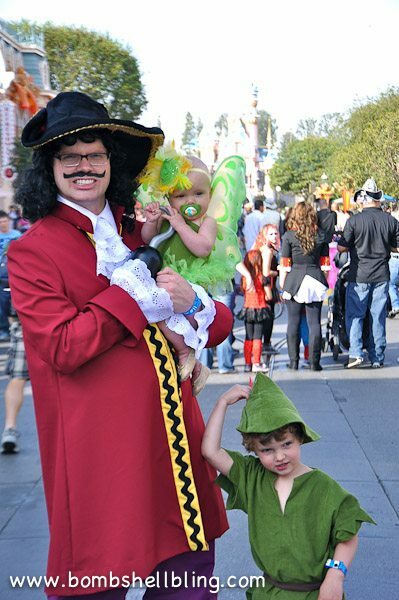 This year he keeps telling me how excited he is to go trick-or-treating in Disneyland and I keep having to remind him over and over that, sadly, this was very much a one time thing. Tough break, kiddo. No other Halloween will ever measure up!! Don’t miss my post on how to make your own Disneyland-inspired Jack Skellington Caramel Apple, plus more pictures of our magical Halloween trip to Disneyland! Mickey’s Halloween Party is one of my FAVORITE things ever!! The park transforms, the villains come out to meet you, the Dapper Dans wear ghoul makeup and float down a misty river singing songs from The Nightmare Before Christmas, the ride The Haunted Mansion is transformed to be The Nightmare Before Christmas themed, there are special Halloween-y treats available around the park, and you can go trick or treating as you walk from ride to ride!!! 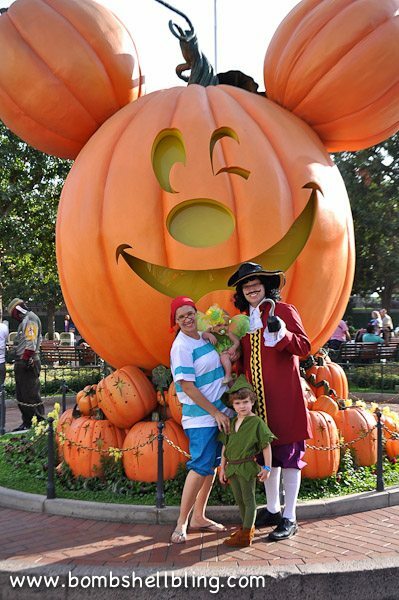 *SWOON* If you are thinking about taking your family to “The Happiest Place on Earth” this Halloween season then you should check out the travel agency Get Away Today. They have vacation LAYAWAY PLANS! Isn’t that brilliant?! Paying off your vacay a bit at a time makes it so much more realistic and affordable! Check out their amazing discounts and packages, and be sure to use the coupon code BLING to get an additional $10 off of your booking!